Digital marketing executives have huge demand these days. You do not need to have an MBA or digital marketing certifications, because your projects will prove you know digital marketing. 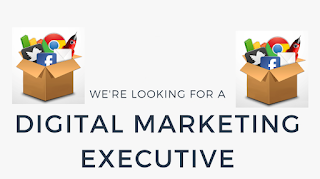 There are few roles and responsibilities that a digital marketing executive must perform on a daily basis or as needed. They include promoting the brand to target the right public, following the evolution of the trends, running campaigns, to rise to the top of the search engines, to apply the best strategies, and the list goes endlessly. To pursue a career as a digital marketing executive as a fresher you need to aware of basic things about social networking platforms, Search Engine Optimization techniques, blogging, WordPress, etc. If you have any blogs with good content is an added plus point to the resume. Please have a look at the Digital Marketing Executive Resume for Freshers below. Having good experience in Digital Media Marketing, Social Media Optimization, Design and Development of blogs. Backlink analysis of competitors - Quality of backlinks, quality of pages the links are placed on and Collecting Quality related sites from competitors. Competitive analysis – Viewing top competitor sites for target keywords. Checking optimization techniques applied, analyzing backlinks and outbound links and strategies used to gain traffic. SOCIAL MEDIA MARKETING - Knowledge of Social Bookmarking, Social Networking Profiles creations, Social Networking Profile Optimizations, Content, Video Sharing Optimization, Blogging, Blog Optimization. Web Developing – Having the Knowledge to edit/update code on a Web page using HTML. B.Tech in (Computer Science and Engineering) with First Class from JNTU. I (Your Name), hereby declare that the above-mentioned information is true to the best of my knowledge and belief. Place: Chennai (Digital Marketing Executive). This is really great news about this Digital Marketing Agency West Palm Beach topic. Thank you for sharing it with us! Brilliant blog post. Most blogs you read online are boring and don’t offer much information. This was really helpful. And for more information about the Digital Marketing visit this link.